During the month of October, North Star Camp is participating in Camp Moves Me, a fun and easy way to raise money for our scholarship foundation with Camp for All Kids. By running, walking, biking, hiking, swimming or moving during any activity we can help send additional campers who otherwise would not be able to afford it. We have always been proud of the support that our North Star families have provided to our scholarship foundation. For the past five years, during this national campaign, North Star has been the #1 fundraiser. We are looking forward to another strong year! 1. 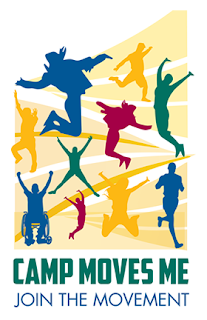 Register for Camp Moves Me. Make sure to join the "North Star Camp" team. 2. Spread the word about your commitment to stay active. Email, post and share your participation and encourage others to do the same. Don't forget to tag North Star Camp! 3. Collect donations and pledges. Remember, the money you raise goes directly back to North Star's scholarship fund, Camp for All Kids. 4. Move, move, move! Track your distance and reach your goal throughout the whole month of October. The more you move, the more campers you can help send to camp!